Kawah Ijen Volcano (2386 m) is an active composite volcano located within the Pleistocene Ijen Caldera (old volcanic crater), at the easternmost part of Java island. The visible superficial manifestations of the hydrothermal system of Kawah Ijen’s activity consist of the world’s largest hyperacidic lake on Earth, a few thermal discharges and crater fumaroles which produce significant amounts of native sulfur. The Ijen caldera complex measures approximately 210 km2. Its name is linked to that of the only currently active volcano within the caldera, Kawah Ijen. The caldera contains more than 15 post caldera volcanic cones making it one of the top recommended area in the world for stunning volcanic scenery. The acidic lake is around 800m wide and 200m deep, his temperature is constantly between 35 and 40 degrees with an acidity approaching 0 (ph: 0 – 14 Drinkable water: 7). The lake is also the source for the river Banyupahit, resulting in highly acidic and metal-enriched river water which has a significant detrimental effect on the downstream river ecosystem. The Ijen caldera complex is a 20 km wide, circular caldera depression that formed over 50,000 years ago as a result of the collapse of the old Ijen stratovolcano due a major eruption. The caldera contains more than 15 postcaldera volcanic cones. Kawah Ijen is the the only currently active system. No recent oberved lava emission, mainly phreatic activitity (steam). Activity :1976, 1817, 1917, 1936, 1952, 1993, 1994, 1999, 2000, 2002, 2012. The most recent significant eruption of Kawah Ijen occurred in Jan–Feb 1817. 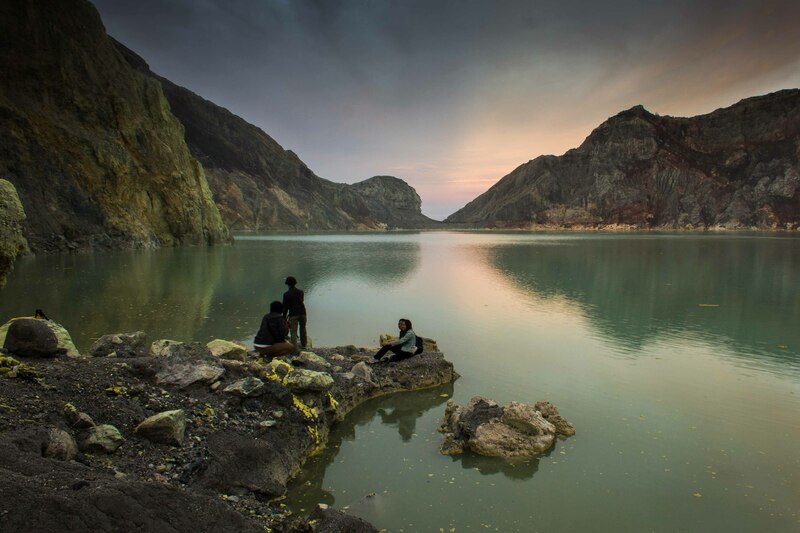 Since the beginning of the twentieth century, a concrete dam on the west side of Kawah Ijen’s crater has controlled the lake overflow.